What DC to AC or stacking ratio can I use? The ratio of PV module STC power rating to inverter output power rating N often referred to as “Stacking Ratio.” Most PV installations are designed for a stacking ratio greater than 1, and less than 1.5. However, the only real limitation on stacking ratio for the HiQ inverter is the voltage and current limitations of the string inputs. The Vmp range for the string inputs is 425 to 850VDC. The specified maximum short circuit current of the DC source is 30A. Two strings with a Vmp of 850VDC and a short circuit current capability of 30A would yield a stacking ratio of almost 6.375 (8 kW) and 8.9 (5.75 kW), which are obviously excessive. A more practical limitation is due to the power and current limits imposed by the inverter firmware. Input power is limited to 5kW and input current is limited to 10A per string by the firmware. The total of these two strings exceeds the output power limit of 8kW, to in reality something less than 5kW would be harvested from each string. Can I use modules with an Isc of more than 10A? The maximum input current on each string is 10A for maximum output power. However, the ‘DC maximum input short circuit current’ for each input, i.e. the maximum current the unit is rated for under fault conditions, is 30A. Therefore there is no issue with use of modules with Isc’s up to this value. Are DC disconnects required for HiQ inverters? disconnect. More background on this topic may be found in theapplication note shown here. 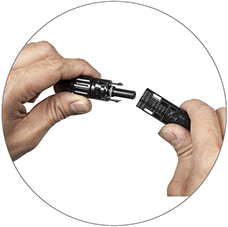 Where can I purchase the MC4-style connectors used on TrueString inverters? These are manufactured by Renhe Solar (www.renhesolar.com). 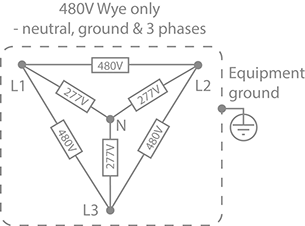 480V and 208V wye only – neutral, ground and 3 phases. Also known as a 5-wire system. 480V example follows. Do you have an example line diagram? The metal enclosure of the inverter must be grounded per NEC 690.43. Equipment ground is provided through the AC connection. Optionally, grounding may be achieved also through attaching an Equipment Ground Conductor (EGC) to a lay-in lug (not provided) attached to the chassis. Grounding may also be achieved using the mounting bolts to any properly grounded metallic structure provided a paint-cutting washer is employed, such as a stainless steel star washer. All 5 circuits (L1, L2, L3, Neutral, Ground) must be connected and Neutral must be bonded to earth ground. Failure to do so can damage the unit and void the warranty. 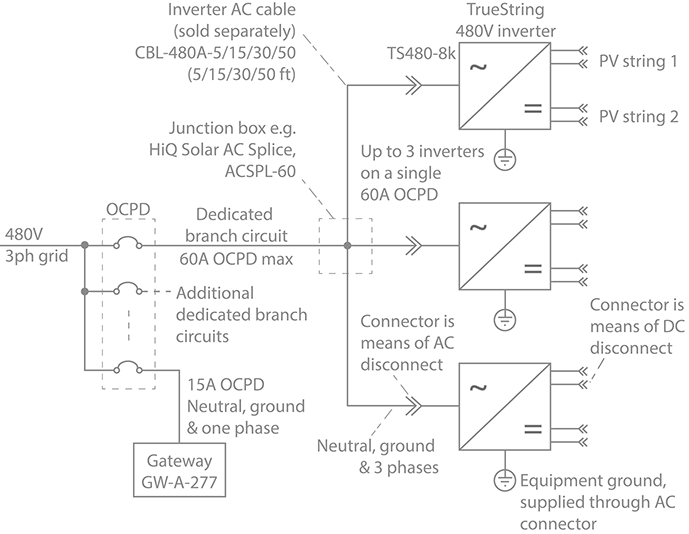 The HiQ inverter exports power only on the Line conductors. The neutral conductor is used solely for voltage sensing and PowerLine communications. Are AC disconnects required for HiQ inverters? Do HiQ inverters meet the requirements for NEC 2014 Rapid Shutdown? Our inverters easily comply with this requirement. More details may be found here. How does connecting up to 3 HiQ inverters on a single OCPD comply with the NEC? This is answered comprehensively in the document here. Can I use TrueString Inverters with a Transformer?